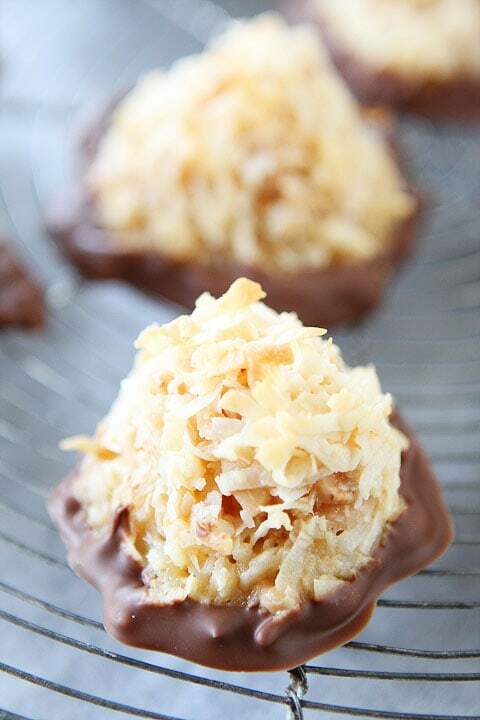 You are going to love this coconut macaroon recipe! 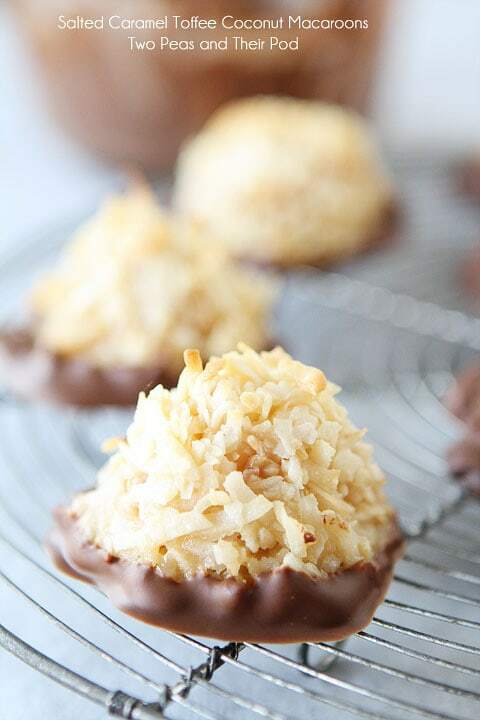 The addition of salted caramel, toffee, and chocolate make these the BEST coconut macaroons ever! 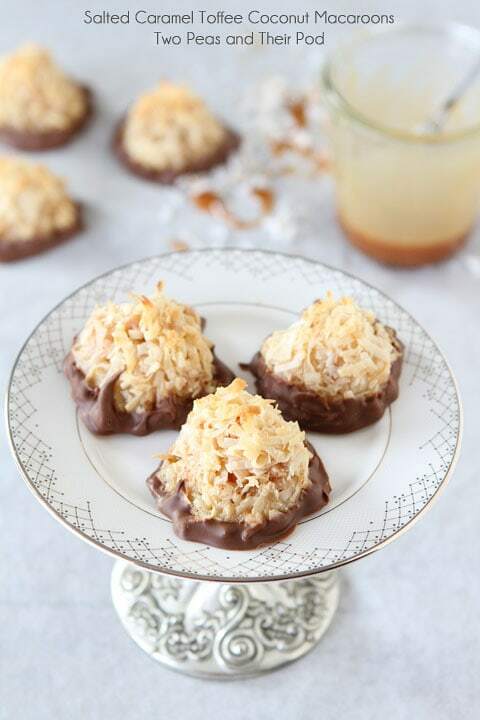 I love a classic coconut macaroon, but these Salted Caramel Toffee Coconut Macaroons are my all-time favorite. I know that is kind of a mouthful of a title, but I promise, you will want a mouthful of these decadent macaroons in your mouth. The salted caramel and toffee combination is unreal. It takes the classic coconut macaroon to a whole new level. And I didn’t stop there, I also dipped the bottoms in chocolate. Salted Caramel Toffee Coconut Macaroons, where have you been all of my life? I love you! What is the Difference Between a Macaroon and Macaron? Let’s talk about the difference between a macaroon and a macaron so there is no confusion. Macaroons are made with coconut and macarons are a soft meringue based French cookie. Macarons are sandwich cookies and come in a variety of colors. The cookies are both delicious, in my opinion, but VERY different. The macaroons we are talking about today are coconut cookies and MUCH easier to make than macarons, which can be a little tricky. Our traditional coconut macaroon recipe uses all sweetened condensed milk. For these macaroons, I used half sweetened condensed milk and half salted caramel sauce. Best decision ever. The salted caramel sauce is amazing! I also added in toffee bits because I love caramel and toffee together. These macaroons have it all-coconut, salted caramel sauce, toffee, and chocolate. They really are perfect. I’ve made them a few times now and everyone always raves over them. So make a batch of Salted Caramel Toffee Coconut Macaroons and share with your family and friends. They will be impressed! Do Coconut Macaroons Need to Be Refrigerated? If you are going to eat the coconut macaroons on the first or second day, you can store them in an airtight container on the counter. If it is hot or humid, I would store them in the fridge so the chocolate doesn’t melt. And if you plan on keeping them for longer than a day or two, I would keep them in the refrigerator. 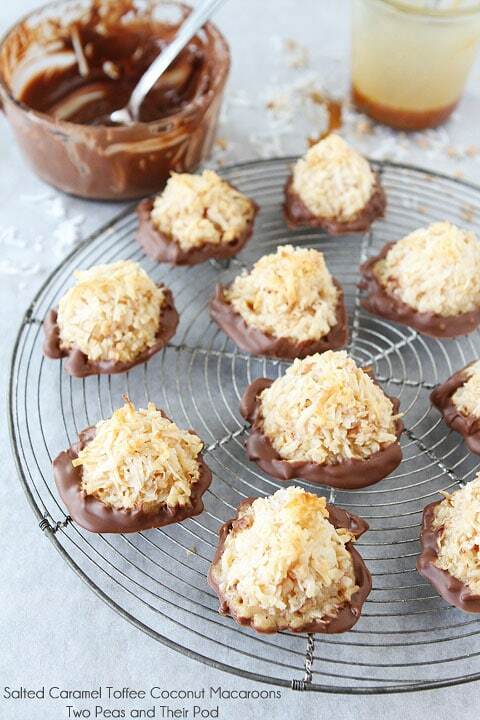 You can also freeze coconut macaroons for up to 2 months. Preheat the oven to 325°F. Line a large baking sheet with parchment paper or a Silpat mat. In a large bowl, stir together the salted caramel sauce, sweetened condensed milk, egg white, vanilla extract, and salt. Stir until combined. Add in the coconut and toffee bits and mix well. Bake the macaroons for 17 to 20 minutes, or until slightly golden brown. Cool the cookies on the baking sheet for about 5 minutes or until they are firm and set. Transfer to a cooling rack and cool completely. Melt chocolate chips in a microwave safe bowl. Make sure you keep stirring the chocolate every 20 seconds or so until chocolate is melted and smooth. Lay out a large piece of parchment paper or wax paper. Dip the bottom of the macaroons into the chocolate-just so the bottoms are covered. Set dipped cookies on the paper to dry. Dip all of the cookies and let them sit on the paper until completely dried. Store in an airtight container on the counter or in the fridge. I recommend the fridge if you are storing them for longer than a day or two or if you live in a warm and humid climate.